The Carrera 1000 PC is designed for applications requiring flexibility, performance and ease-of-use at an affordable price. It is a PC-controlled electronic flowrapping machine, with a multi-axis drive, best suited for smaller products of different sizes. It can wrap at speeds of over 200 ppm with the optional multiple jaws. PC-controlled HFFS machine with rotary sealing jaws. Multi-axis drive technology with 3 independent drive circuits, consisting of an AC motor controlled by a frequency inverter, for product infeed, sealing rollers and rotary sealing jaws. A simple-to-use operator interface allows quick product change-over. 64 program memory; two-level password protection security. Automatic adjustment of film-pull, infeed and sealing parameters during product or program change. Precision temperature control circuits ensure seal strength and quality. Single piece transparent guarding with safety interlock. Robust mechanical construction with welded sheet metal main body, epoxy powder coating or (opt.) stainless-steel finishing. Hygienic design with cantilevered body and infeed, for easy clean down. Single film reel mounting with self-centering cones, right hand machine version, 2 m long infeed, standard. 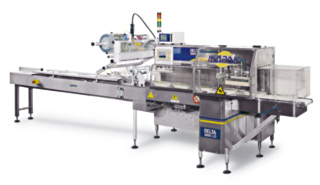 In-line and right-angle types of automatic feeders available on request. Production output dependent upon product, film and machine specifications. Cut-off defined as: product length + height + 40 mm (1.6”), depending on product characteristics. 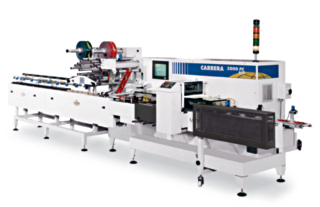 The Carrera 2000 PC is a PC-controlled flowrapping HFFS machine with 4 drive circuits and rotary sealing jaws, with all functions available to the operator at the touch of a finger. It can achieve throughput speeds well over 500 ppm (with optional multiple jaws) for almost any kind of product whether naked or in tray, with maximum flexibility. Designed with ease of cleaning and efficient maintenance in mind, before delivery this machine is always finished and tested in our factory to fully meet your specific requirements. Multi-axis drive technology with 4 independent drive circuits for: product infeed, film unwind, sealing rollers, rotary sealing jaws. A simple-to-use colour touch screen operator interface. 2 electronic cam output, user definable, for peripheral devices. Counters, diagnostics, trouble shooting, machine configuration, PC-typical ISA-standard ports: all available. Individual temperature control circuits ensure seal strength and quality. Programmable film tensioning control system based on load-cell. No product/No bag & Misplaced product detection system. Robust mechanical construction with welded sheet metal main body; epoxy powder coating or (opt.) stainless-steel finishing. Hygienic design, cantilevered body and infeed, for easy clean down. 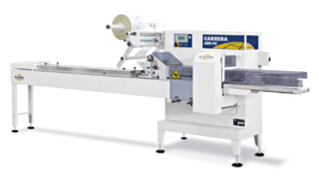 The Carrera 3000 HS is a high-speed flowrapping machine with rotary sealing jaws, designed to be an integral part of a fully automatic packaging line. Well adapted to food products, commonly bars and snacks, it really shines for applications that require high performance and very reliable operation with either heat-sealable or cold-sealable films. 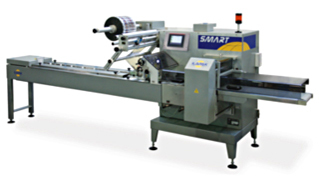 Its main features include an integrated pressure-free multibelt smartfeeder as well as an automatic film reel splicer. PC-controlled HFFS machine with rotary sealing jaws, for high speed. Integrated pressure-free 9-belt smartfeeder, quick release belts tool-less removable. Multi-axis drive technology with 14 independent drive circuits and Siemens brushless motors. Machine and smartbelt fully PC-controlled. Simple-to-use 10” VGA colour touch screen operator interface, with intuitive icons. 100 program memory; two-level password protection security. Multiple electronic cam output for peripheral devices. Double film reel mounting with integrated automatic spot to spot film splicer. Programmable film tensioning control system based on loadcell. High speed PEC for print registered films. Robust mechanical construction with welded sheet metal main body, epoxy powder coating as standard. Hygienic design, cantilevered body and infeed, quick removable discharge belt for easy clean down. Product quality control on discharge belt. Range of tailor-made automatic feeders available. 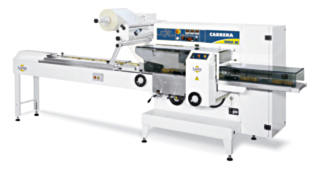 The Carrera 500 PC is our best selling, most cost-effective and flexible flowrapping machine. It boasts 3 fully independent drive circuits and motors, making it the ideal electronic HFFS machine for companies with low to medium output and a wide range of products. The simple-to-use operator interface allows rapid product changeover, with all product parameters restored at the touch of a button. Production speeds, with a single jaw, can reach up to 100 cpm. Tray indexers and friction belt feeders are available as options. Multi-axis drive technology with 3 independent drive circuits consisting of an AC motor controlled by a frequency inverter for product infeed, sealing rollers and rotary sealing jaws. Robust mechanical construction with welded metal sheet main body, epoxy powder coating or (opt.) stainless-steel finishing. Single film reel mounting with self-centering cones, right hand machine version, 2,5 m long infeed, standard. 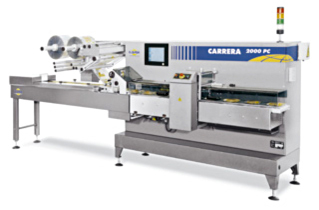 The Delta 2000 LD is a flexible flowrapping machine ideally suited for a wide range of food and non-food industries, with throughput speeds of up to 60ppm, with or without MAP. Its main features include PC-controlled electronic multi-axis technology, variable cut-off length, no product/no bag, misplaced product detection system and automatic size-change functions. With its long dwell sealing head, it produces robust and reliable hermetic seals with laminated, co-extruded and shrinkable barrier films. Long-dwell sealing head to optimize sealing cycle. 3 AC motors to control infeed, rollers, jaws (additional motors with automatic feeders). User frendly 6″ colour VGA touch screen operator interface with intuitive icons. 64 programs (additional memory on request). No product / No bag. Ports for peripheral units (printer, labelers, gas control, etc.). Programming via AT compatible keyboard. Single film reel mounting with self-centering cones, right hand version, 3 m long infeed, standard. Robust, hygienic, easy to clean design, stainless steel finishing standard. Production output depends on film sealability and product characteristics. Length Up to 600 mm - 24"
Film cut-off Min 100 mm - 4" / Max 650 mm - 26"
Depending on film and product characteristics. Wrapping materials Shrink Barrier films, laminated, co-extruded and all sealable films. 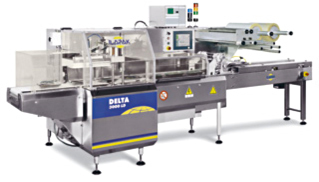 The Delta 3000 LD is a versatile flowrapping machine well suited for both food and non-food products whether naked, pre-wrapped or in trays. This machine can achieve throughput speeds of up to 110ppm, with or without MAP. Its main features include PC-controlled electronic multi-axis technology, variable cut-off length, no product/no bag, misplaced product detection system and automatic size-change functions. With its long dwell sealing head, it produces robust and reliable hermetic seals with laminated, co-extruded and shrinkable barrier films. 4 AC motors to control infeed, rollers, jaws, film feed (additional motors with automatic feeders). User friendly 10″ colour VGA touch screen operator interface with intuitive icons. Film tensioning and power unwind system controlled by loadcell. Double film reel mounting with self-centering cones, right hand machine version, 3 m long infeed, standard. Robust, hygienic, easy to clean design, epoxy powder coating standard or (optional) stainless steel finisching. Film cut-off Min 100 mm - 4" / Max 1200 mm - 47"
The Smart is a versatile and easy to use flowrapper designed to meet the needs of first time users of automatic packaging machines. Capable of high speeds of up to 100 packs a minute, the new Smart horizontal, form, fill and seal (HFFS)machine is ideal for a wide range of food and non-food products, from bakery products, fresh produce and confectionery to cutleries and medical equipment. PLC controlled, the Smart flowrapper has a colour touch screen operator interface so is exceptionally easy to operate, making product changeovers quick to carry out. PLC-controlled HFFS machine with rotary sealing jaws. Multi-axis drive technology with 3 indipendent drive circuits consisting of an AC motor controlled by a frequency inverter for product infeed, sealing rollers and rotary sealing jaws. Operator interface with TFT touch screen display, 5,7” wide. 99 program memory; two-level password protection security.